Oils and Pigment on Elephant Paper. Simon has painted throughout his life and started exhibiting formally in 1998. 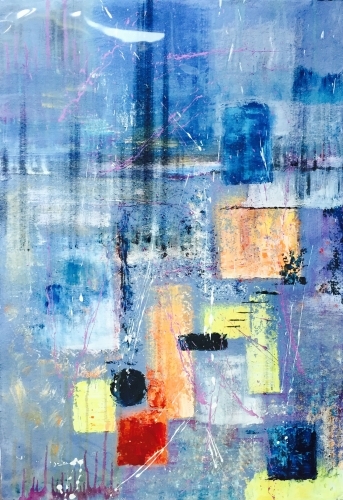 Over the past few years he has moved into abstraction, continuing with his use of dramatic texture and colour. Simon’s smaller works are predominantly oil on paper which gives a very different intensity than oil on canvas. Oil colour dries very quickly on the absorbent surface of the paper allowing layers of colour to be built up in a short period of time and in Simon’s view preserves the momentum and energy in creating the pictures.